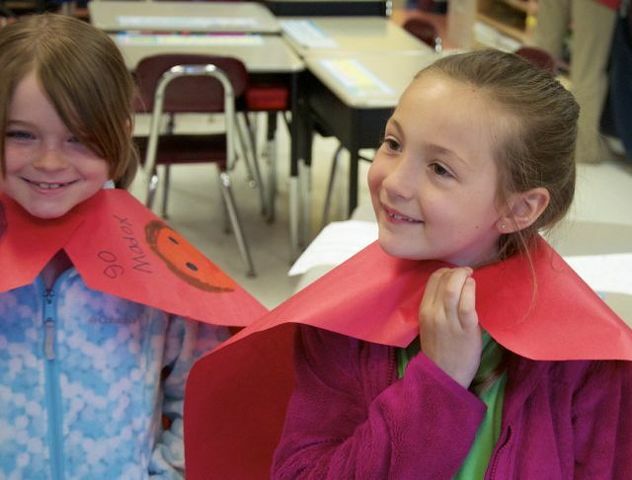 Photo by Michael Martin Garrett/StateCollege.com // Makayla Raptosh, right, and her friend show of the superhero capes they made in honor of Makayla's younger brother Maddox. Twenty-two-month-old Maddox Raptosh has spent about a third of his young life in hospitals and operating rooms. His mother, Michele Raptosh, vividly remembers everything her child has overcome since his birth last August. He was born with a hole in his stomach, which kicked of a series of health issues including multiple hernias, infections, surgical complications, a liver transplant, and more. Then on Tuesday, which was National Super Hero Day, something truly super happened. Makayla Raptosh, a second grader at Gray’s Woods, says watching her youngest brother go through so much pain and suffering has frightened and saddened her. But when she looked around at her classmates on Tuesday – some who were wearing handmade capes that said things like “Go Maddox” – she felt happy again. Her teacher Erin DiPerna calls her “incredibly resilient,” managing to stay friendly, compassionate and on track in school despite everything going on at home. Raptosh sadly admits that her time in the hospital with Maddox means she’s sacrificed a lot of time with Makayla and her other son Max. She’s missed first days of school, cheerleading practices, dance practices and other moments she knows she’ll never get back. But despite so much hardship, Raptosh says her children never let her down. Makayla, especially, has truly risen to the challenge. As the oldest child, she’s taken it upon herself to look after her brother, study his ailments and memorize his medications. While it can be difficult for families and children to confront death and disease, DiPerna hopes it can help her students learn the value of empathy, compassion and support for those in need. And at the end of the day, Makayla and Raptosh just want to see Maddox grow stronger. “I hope he can lose his meds and that nothing else goes wrong and he can play football and stuff,” Makayla says. For every needle poke, scan, test and surgery that Maddox goes through, Raptosh adds another colorful bead to a strand that “has to be a mile long” as a visual reminder of everything that Maddox has overcome. But for Raptosh, each bead is also a reminder to treat everyone she meets with the compassion and support that she’s received from everyone around her. She says she’s been “truly touched” by the way everyone from close friends to total strangers have supported her family, and she hopes to do the same for others. 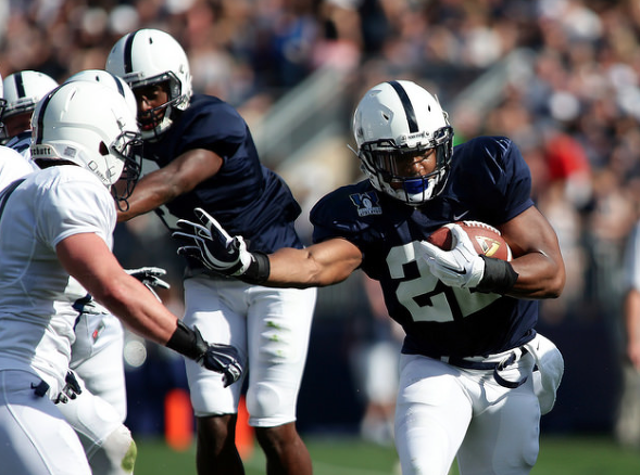 Is Von Walker the Most Interesting Man on Penn State Football’s Defense? With many Nittany Lion football fans pining for marquee matchups, a Penn State-Georgia series might not be out of the question. According to Seth Emerson of The Telegraph in Georgia, Bulldogs' athletic director Greg McGarity is interested in getting his fans on the road to some of the nation's most "iconic" stadiums.